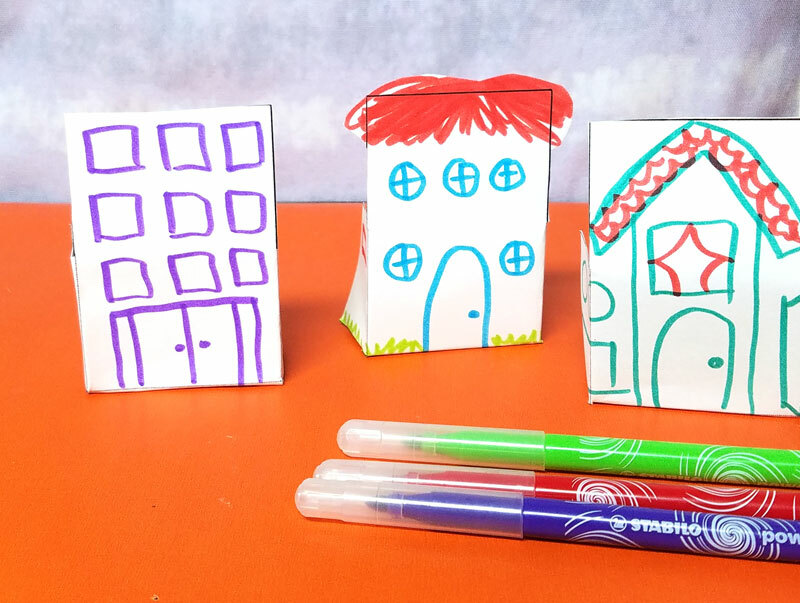 Home Crafts Paper Houses – Free Printables to Color and Play! 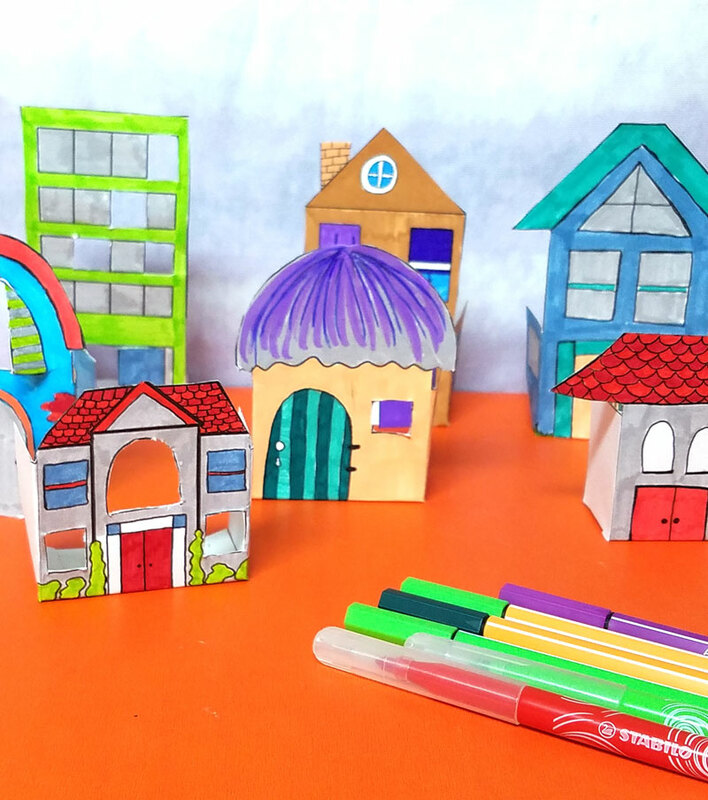 Print and color these beautiful paper houses – they are perfect for playing with or even for setting up a decorative village just for fun! 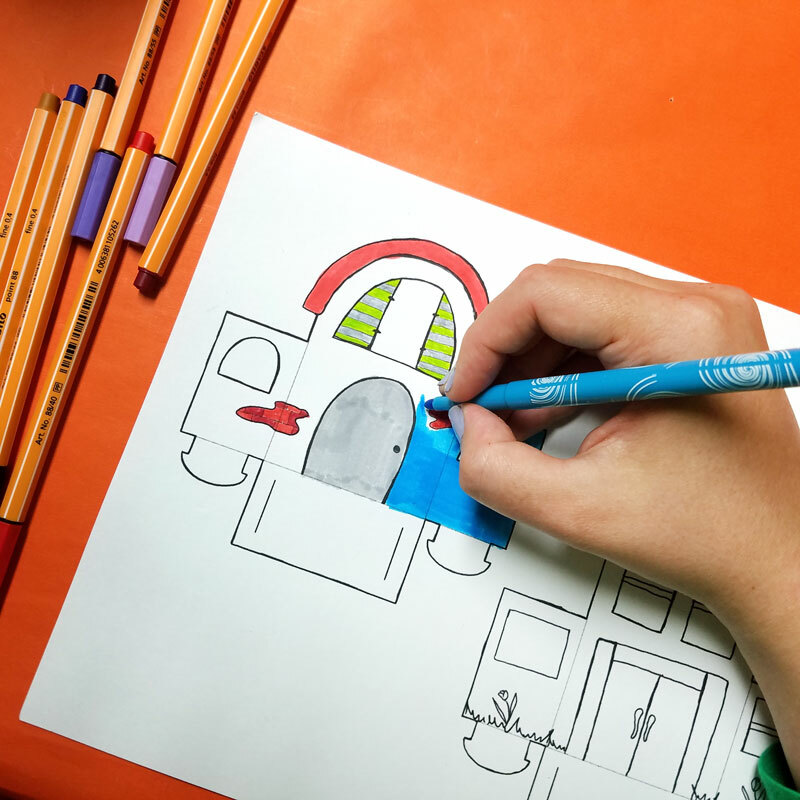 I partnered with STABILO to bring you seven different house designs, plus a blank template so that you can design your own. 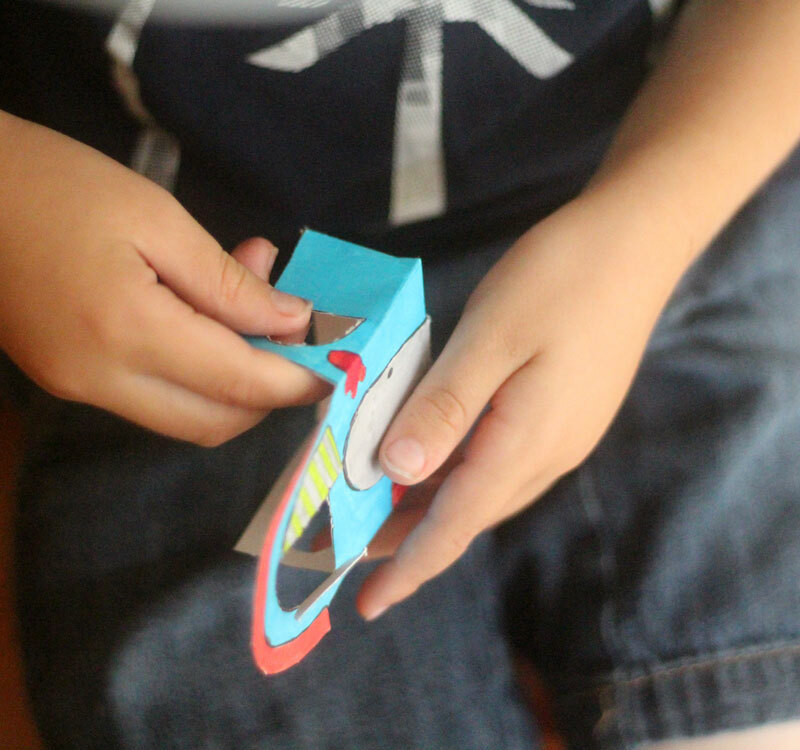 If you love paper toy templates, you can also try these cool paper glasses! I love crafting alongside M and I know that many of you love to bond over craft time as well. 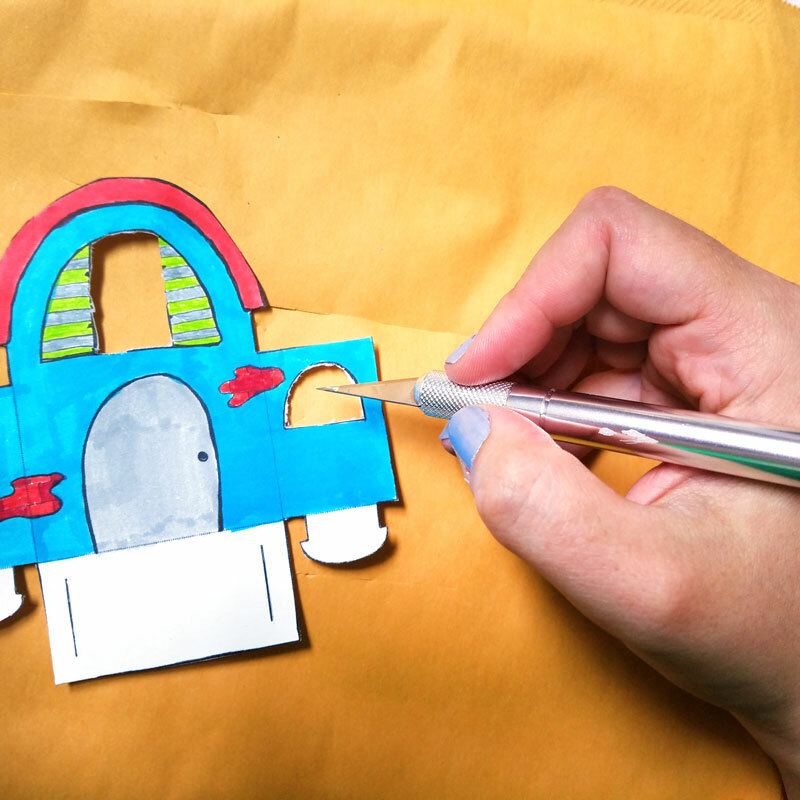 So I designed this fun paper craft to be something that moms (or grandmas, aunts, and babysitters) can create together with kids of all ages. I truly believe that arts ‘n crafts come in all sizes, and I love crafts that ANYONE can do, which is why I took this direction. 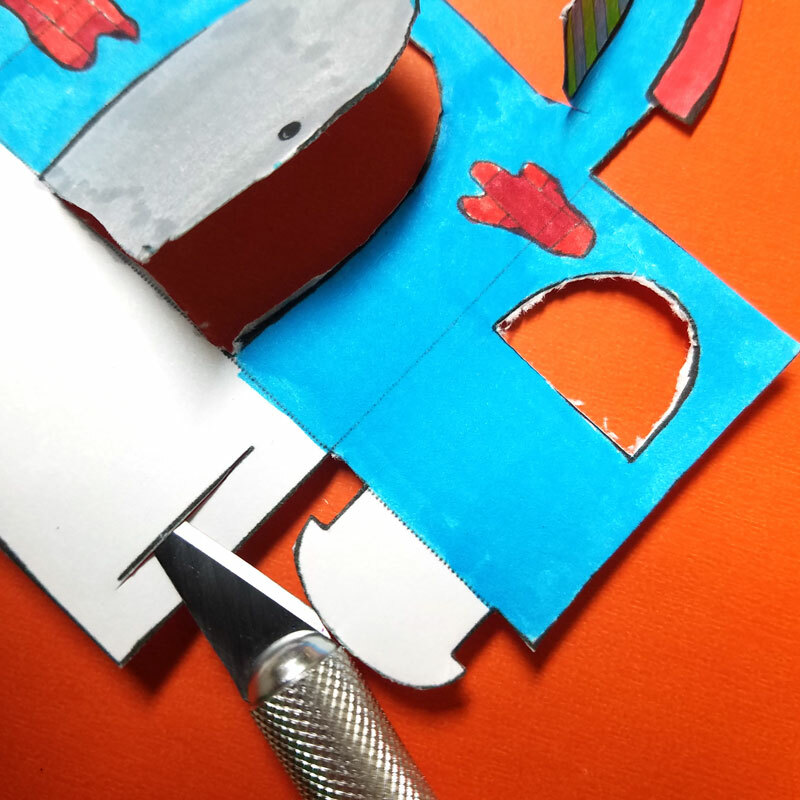 You can add texture and detail and make this craft more complex. Or, do like M did and just color for the fun of it! I pulled out our marker storage caddy that I made a month ago, and set it up on the dining room table so that M and I can craft together. M and I colored these using a mix of STABILO markers. M loves using the Power Max markers because it looks just like the Power markers that I use, but it’s chunkier and easier for him to grip. I love them because they’re washable, and don’t dry out for a long time, even if he forgets to cap them. 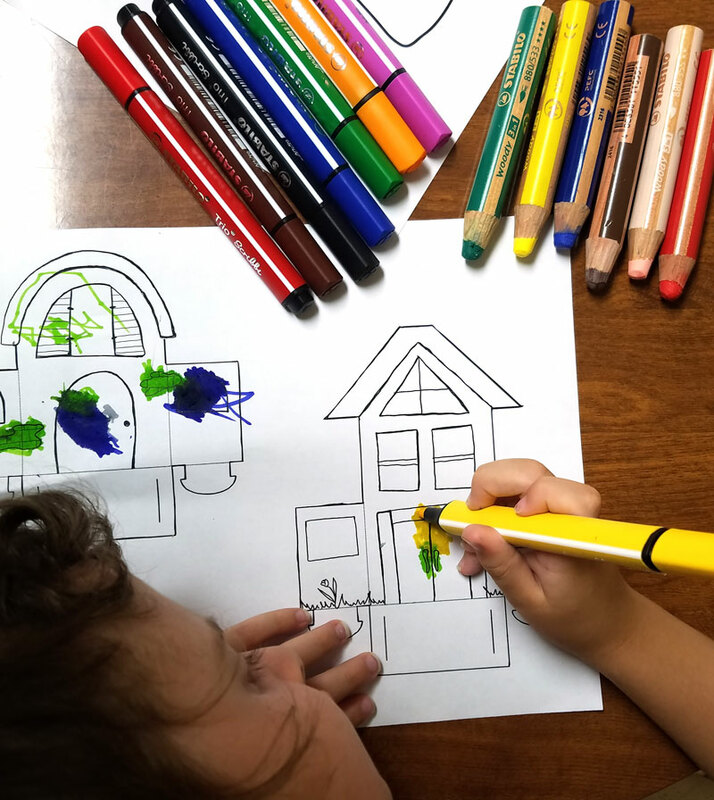 He also loves coloring with the Trio Scribbi markers – the triangular shape is great for training him to hold them properly (he’s still learning!) and the spring tip bounces back when he gets overly enthusiastic and jabs the markers. I pulled out my classic mix of markers. STABILO Point 88 helped me get into the tiny spots, Pen 68 worked me through most of the medium areas and the Power markers helped me cover more space quickly with rich color. Besides for the awesome color, I loved how consistent the coloring was between markers, so that I was able to switch between them mid-area. 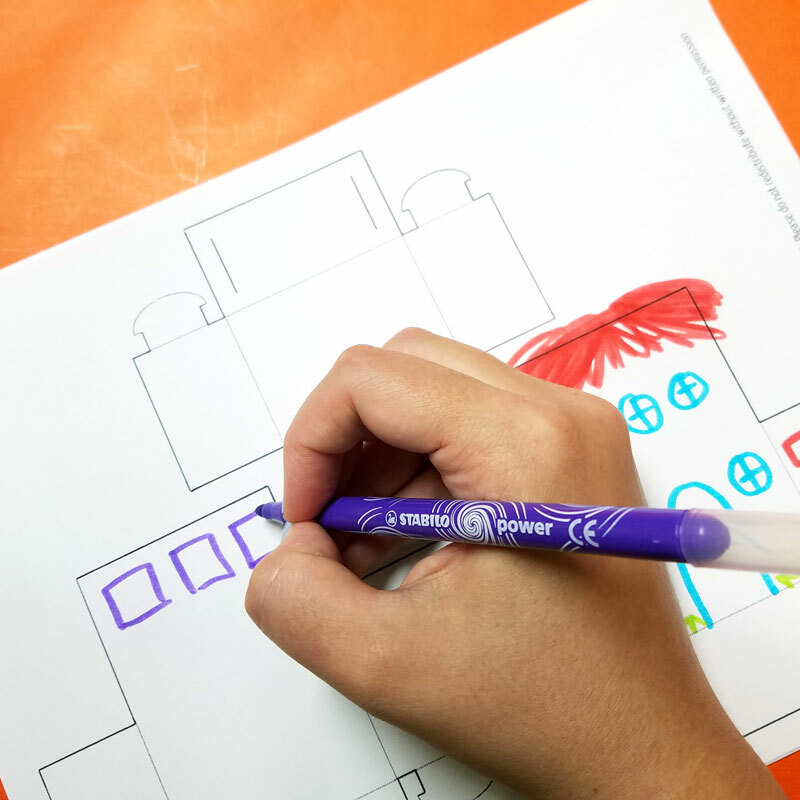 Even though they’re designed for kids, I found the Power markers to be so much fun to use! The color quality is on par with my “grown-up” markers but it has the same quality as the Power Max markers: if I forget to cap them properly, they don’t dry out for weeks! 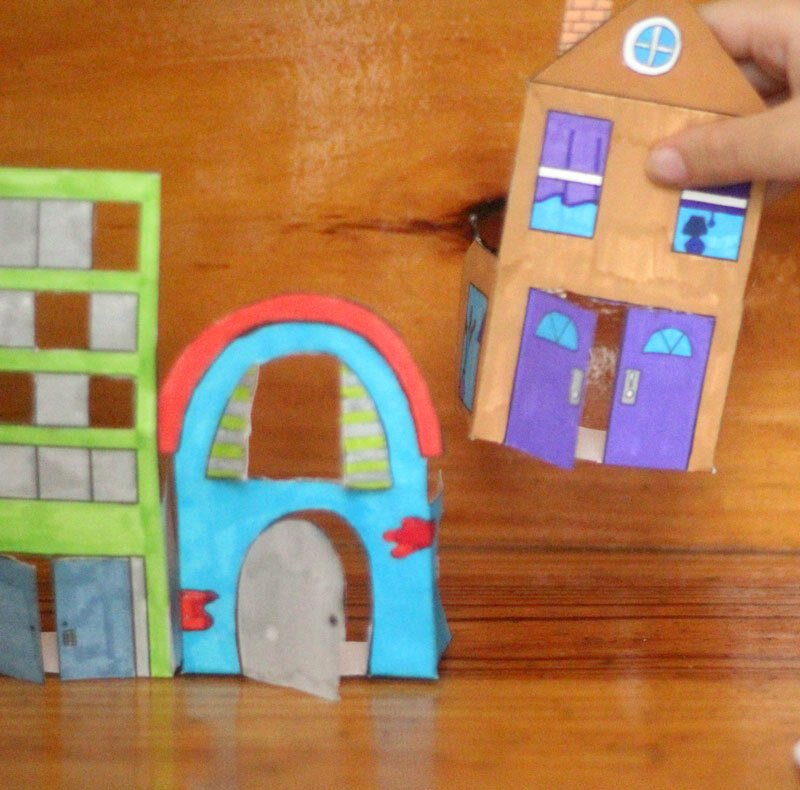 These paper houses were created in a blend of whimsical and realistic styles. 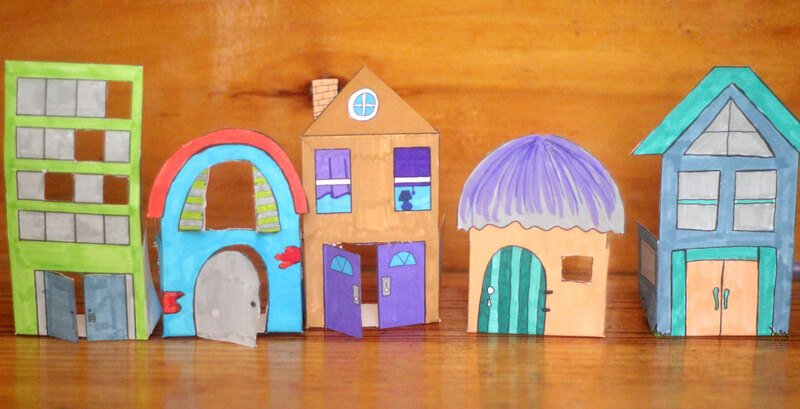 You’ll find vintage homes, fairy houses, and even an apartment block! I also included a copy of my “blank template” that I designed as the basis for these so that you can get more creative and design some yourself. You can leave the doors and windows as is, or cut them open. 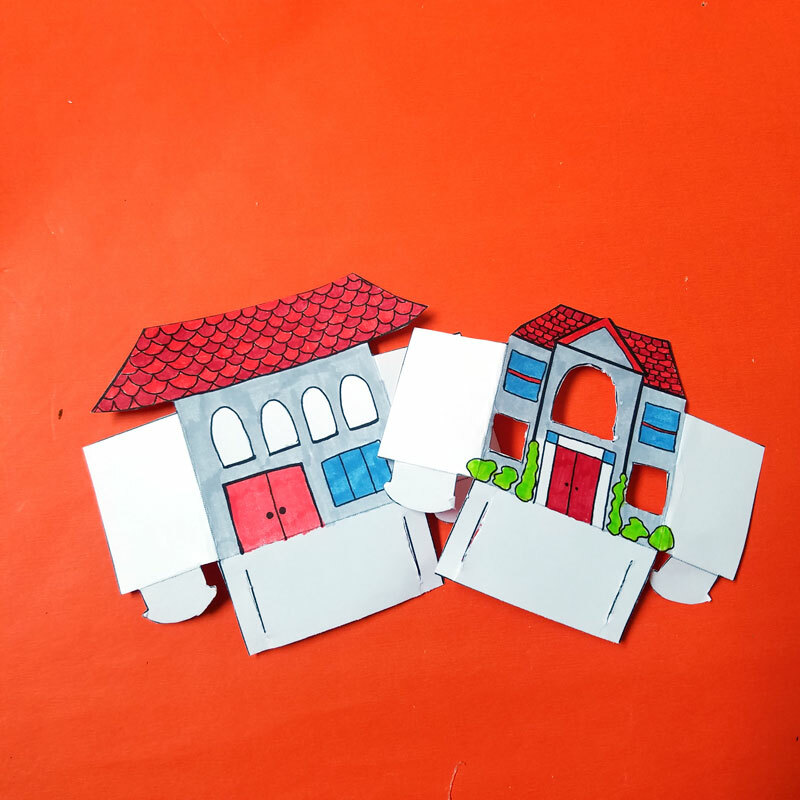 When you’re done, they are the perfect DIY paper toy. 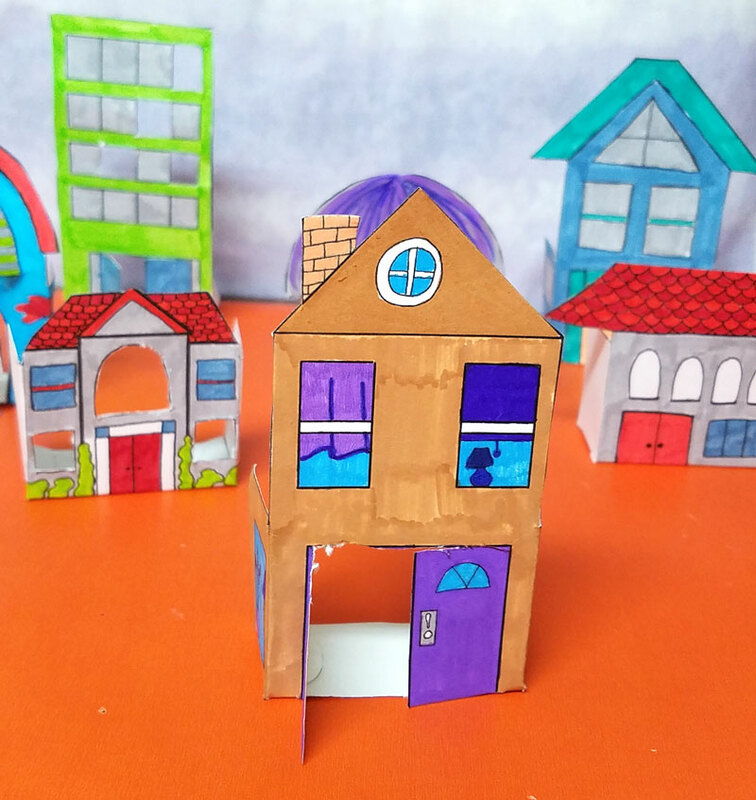 If you’re looking for a more 3-D paper house template try using the template for this gingerbread house craft – it can be made as any type of paper houses! Ready to get crafting? On to the printable and the tutorial! The printable – download them by entering your email address into the form below, and then check your inbox for the PDF file! Print them on card stock. 1. 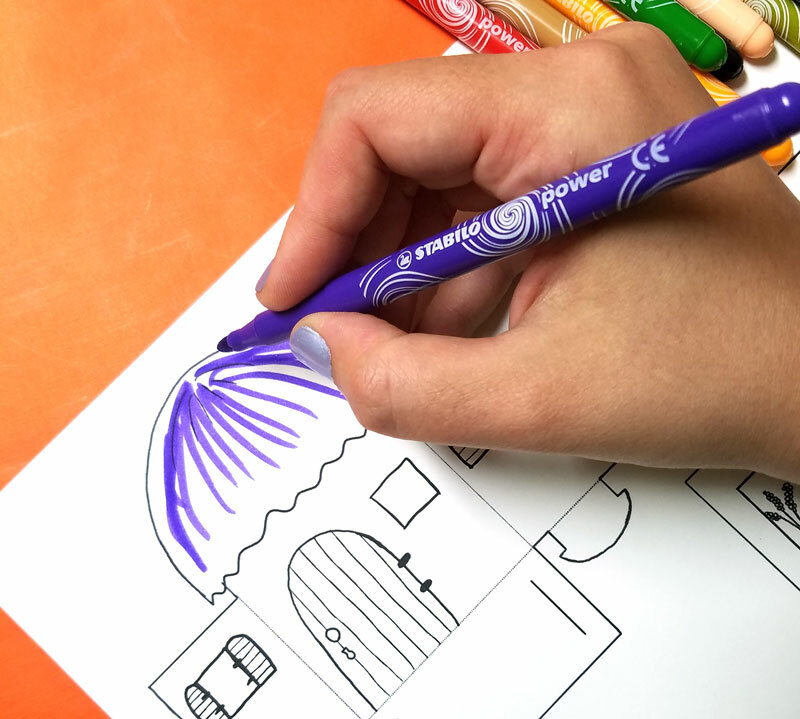 Color, color, color using your favorite STABILO markers! This part is the most fun! Use different shades of similar colors for a little extra texture. 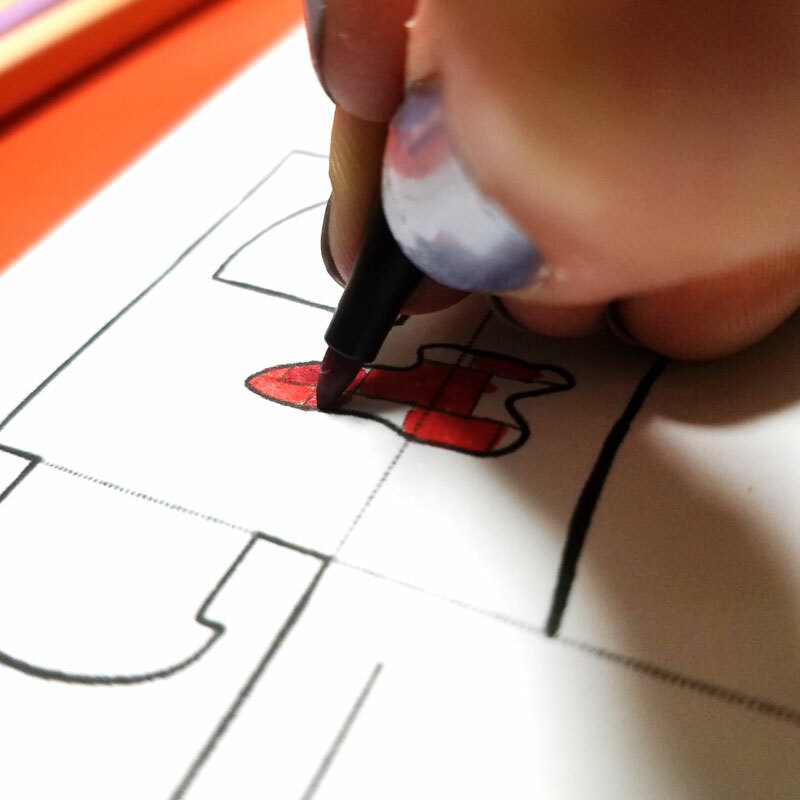 Add your own detail, or to simplify things, combine details and color them in together. Or, add your own detail to the blank templates. 2. 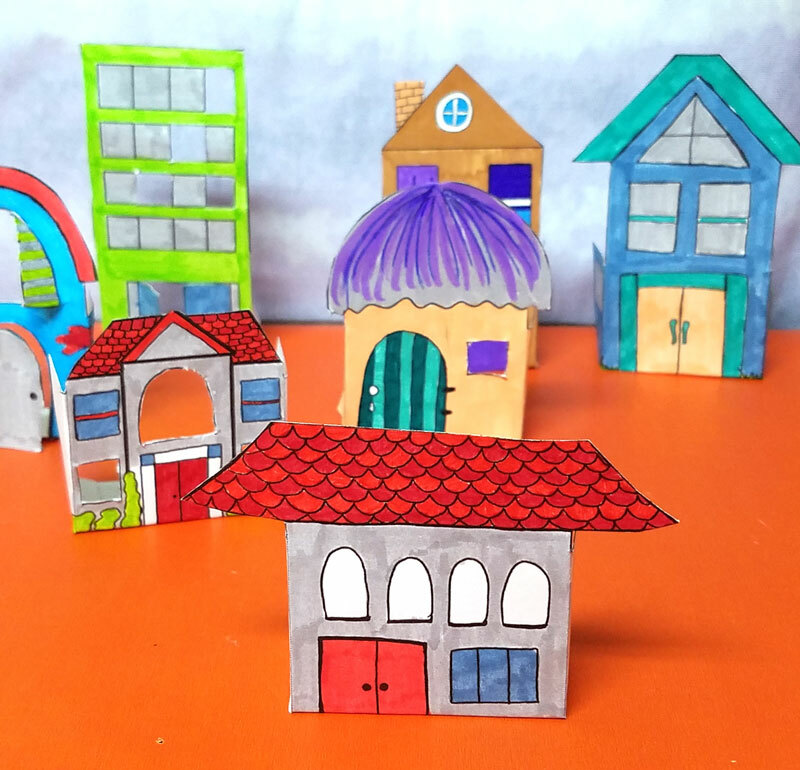 Cut out your paper houses using scissors. 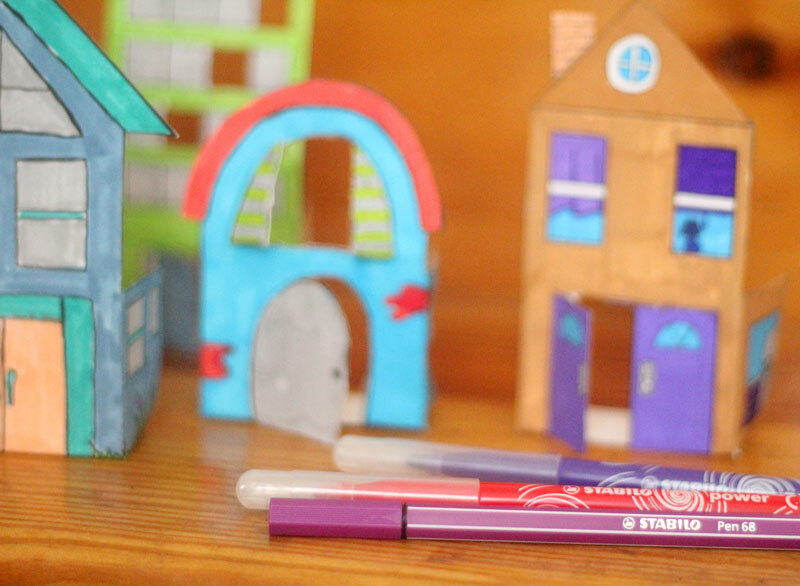 If you want (grown-ups only) you can cut out details such as windows and doors. On this one, I even made the shutters open and close. 3. (Grown ups only) use a craft knife to cut slits in the lines underneath your house as pictured. 4. 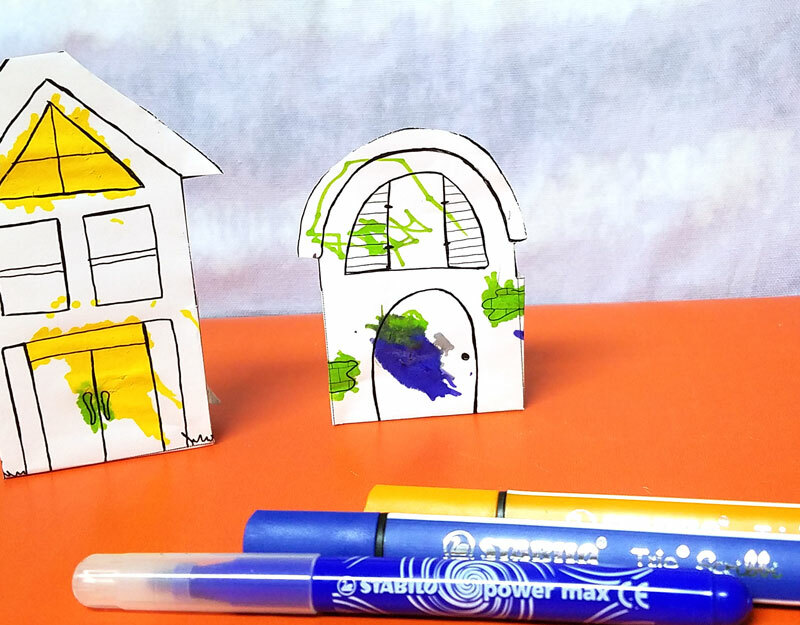 Fold your house on the dashed lines – those are marked for cutting. 5. Insert your tabs into the slots from the outside inward. This is a bit difficult. If you pull it through from the inside of the house, it will work, but if need be you can widen the slots (it will just be less secure once assembled). If you really want the kids to be able to complete this on their own, you can skip the “tab and slot system” and just glue the tab to the base. 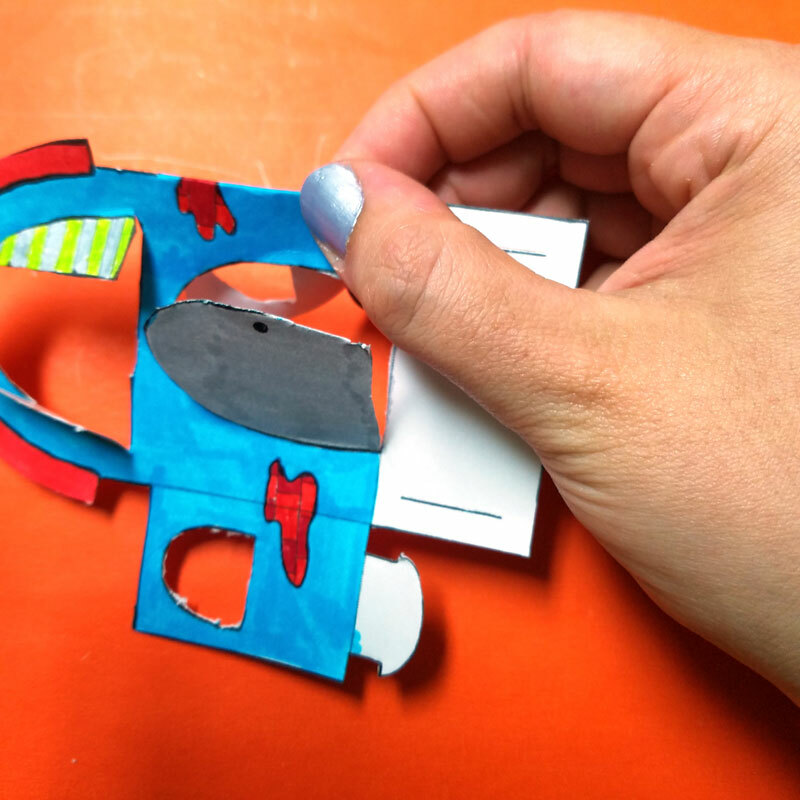 If you DO use the tab and slot, you can fold them flat for storage, but kids will need help cutting the slots open, and may need help pulling the tab through. They’ll also need help if you’re doing cutout windows and doors. Details, details, who cares? 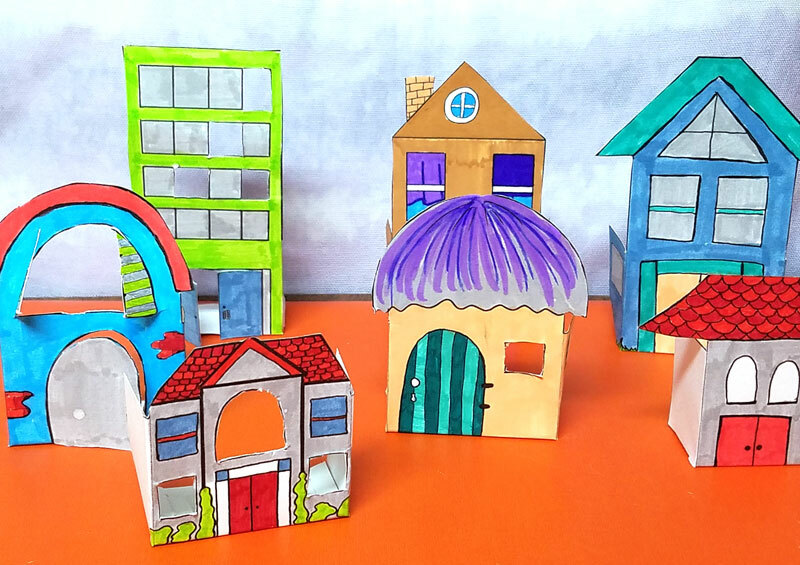 The idea is that you have the time of your life creating these paper houses and that you allow yourself and the kids to be creative while doing so. Don’t be afraid to use color and imagination as I did when creating the templates. 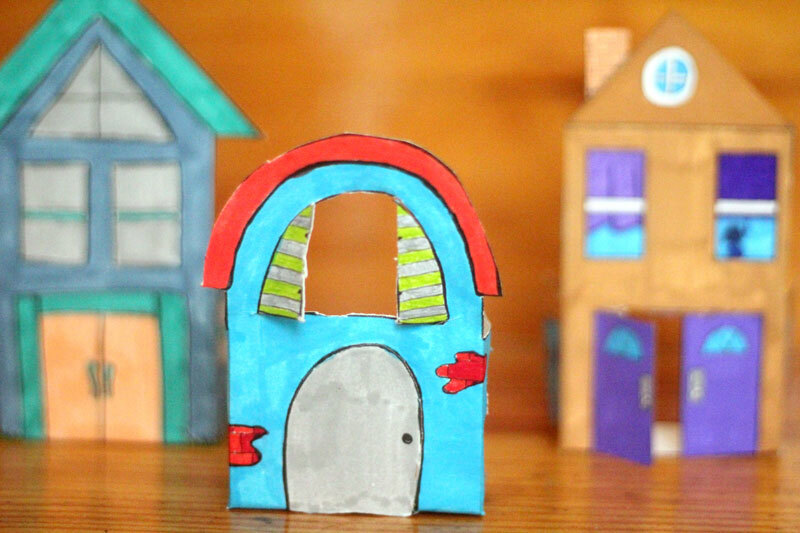 What will you be using these paper houses for? 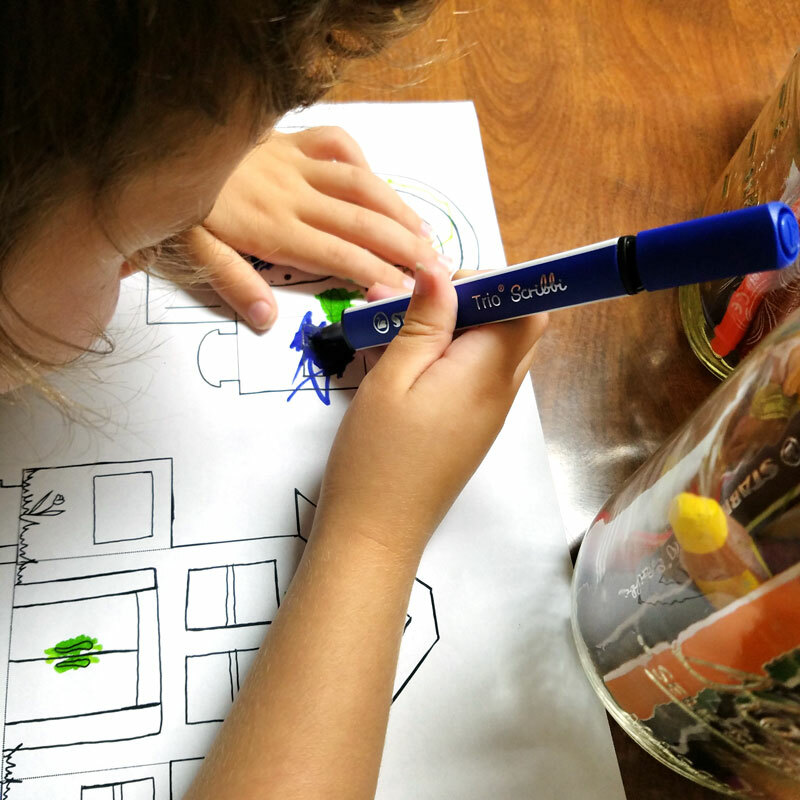 Which STABILO art supplies for kids and grown-ups are YOUR favorite to color with? Comment below! Want more like this? 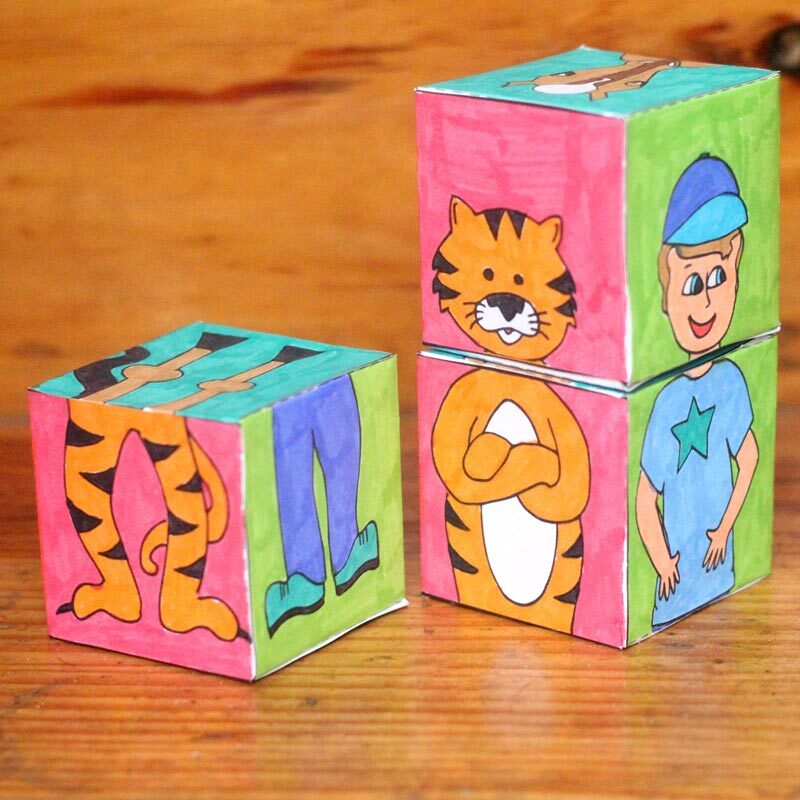 Check out these adorable mix ‘n match animal blocks that are great for crafting together too! 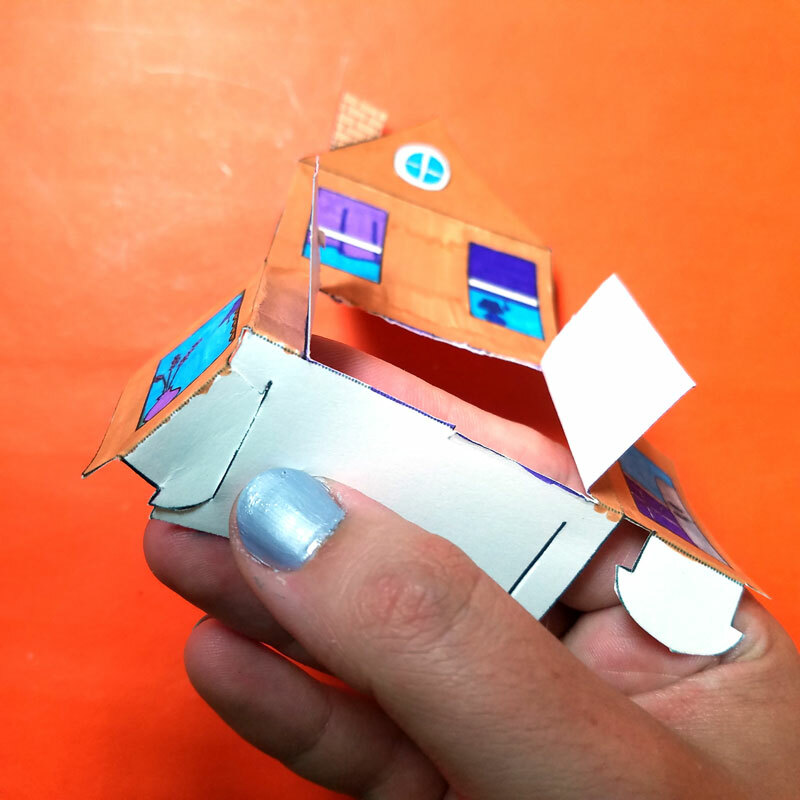 Still haven’t printed your paper houses? Print them by entering your email address below and then check your inbox! (Check your spam folder too if you don’t see it right away). 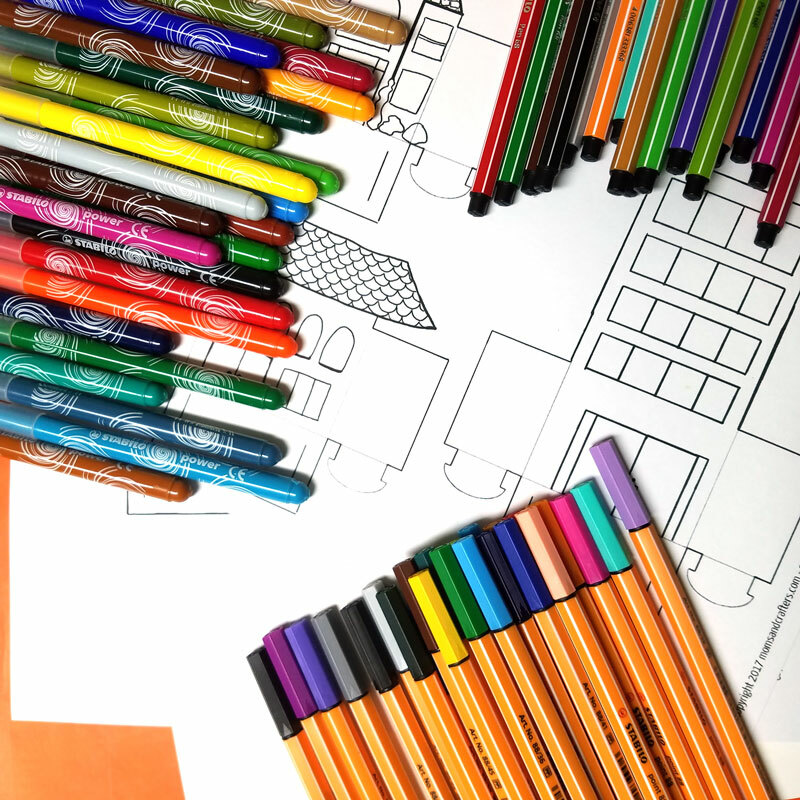 Adult Coloring, Adult coloring pages, Crafts for Adults, Crafts for kids, Crafts for moms, Crafts for tweens, Free Printables, Grown-ups, Kids, Mom Crafts, Paper Crafts, Preschoolers, Printables for play, sponsored. Bookmark. These are so cute! I’d use Christmas-y colors to make a Christmas village – maybe even add some glitter as well! Thank you! I love that twist – thanks for sharing, Maureen! Thanks for sharing that idea, Kelly, that’s brilliant! Lovely little templates. By cutting off the bottom slot piece, and the 2 pieces that insert into the slots, my kindergarten students can fold the two sides and the building will stand up on its own. Using these as a model enables my kindies to make their own.